Action from the recent Posh v Norwich friendly at the ABAX Stadium. Photo: Joe Dent/theposh.com. 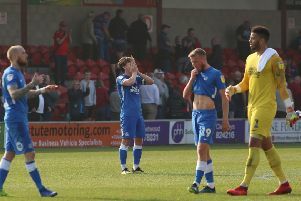 Peterborough United will play Norwich City, Barnet and MK Dons in the group stages of the re-vamped English Football League Trophy following today’s (July 27) draw for the re-vamped competition. Championship club Norwich will field an Under 21 side and they provide Posh with their opening fixture in week commencing August 29. Action from the recent friendly between Posh and Norwich. Photo: Joe Dent/theposh.com. Posh also host League One rivals MK Dons in week commencing October 3 before travelling to League Two side Barnet in week commencing November 7. Two teams from each group qualify for the knockout stages. Football League clubs voted to re-vamp a competition that historically attracts low crowds in the early stages by inviting Premier League and Championship clubs to enter under 21 teams. But the big clubs like Arsenal, Spurs, Liverpool, Manchester City and Manchester United declined an invitation to take part. The prize money has been increased by over £1 million with generous rewards even for winning group matches, but so far the competition has failed to gain popular support.